The name of this bag has earned its honor. 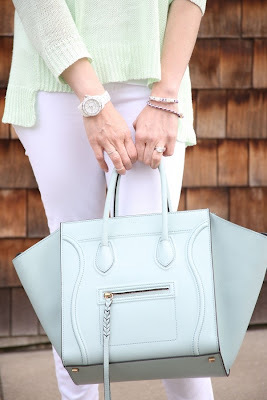 This bag is called Céline Phantom for a reason, it has been in fact hunted for years. 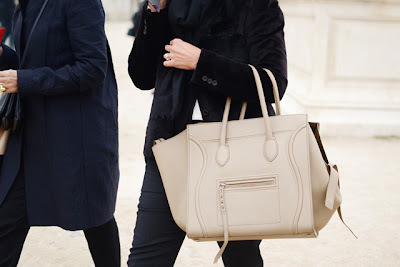 The word Phantom has been adopted by Céline and used as a name of its handbag collection. It is casual but luxurious, simple but distinctive, these are right interprets for the Phantom. The over-sized opening of the bag brings a large capacity and easy-to-access function. More interestingly, the distinctive leather straps on both of the side can not only be used for decoration simply by hanging down like tassels, but also buckled together to make the bag smaller and chic. So the appealing feature of this collection lies in the creative leather strap and thanks to these straps which make the bag lively. The middle part of the bag matching the Luggage Tote but the Phantom expands in size with a more spacious east/west finish. When you zip the bag up, the shape comes back closer to the Luggage Tote. 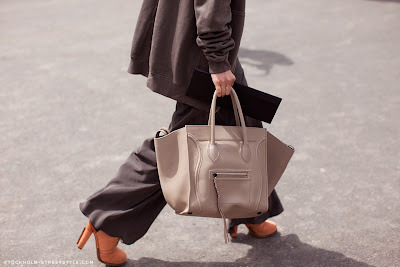 Céline Phantom comes in various materials and as a result different prices. 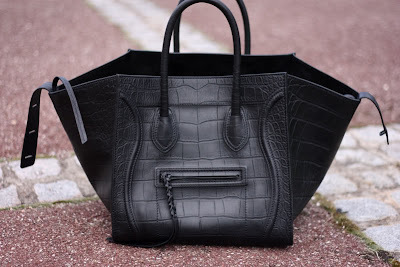 Most Phantom bags come in calfskin or suede.